Skin needling at home can reduce the appearance of your acne scars by breaking down old scar tissues and remodelling your skin with new collagen and elastin fibers. Each treatment lasts only 15 to 20 minutes with little side effects. Unlike other ablative treatments, skin needling does not require long recovery time. When someone wants to improve the skin appearance and treat acne scars, he or she may spend a lot of time and money, but with this article you can learn how to treat acne scars with extremely effective and inexpensive techniques including skin needling. Enjoy! Advanced Treatments for Acne Scars Does Skin Needling Work? What do You Need for Skin Needling? How to Roll? When acne occurs, there is an inflammation response in the skin during the healing process, this is why the pore or comedo becomes larger and the tissue of the follicle breaks up. After that, the own body tries to repair the skin damage and produces an abnormal amount of collagen fibers, at this moment, the scar appears. Also, during this process the skin can get infected, which worsen the scar. When the acne is severe it is more likely for the person to get scars. This kind of scar develops when new collagen fibers are overproduced, or when the skin is infected during the healing process. These scars are commonly compared with a red raised lump on the skin. Never perform skin needling procedure on keloid or hypertrophic scars. These are the most common types of acne scars. They look like indentations in the skin. They are opposite to hypertrophic scars. In this case, the body produces a low amount of collagen fibers to repair the injury. They can be very difficult to treat because many topical products can not stimulate collagen production in this case. This type of scar is produced when the damaged skin becomes darker in the area that surrounds the injury. This kind of scar is very common too, and it can disappear after four weeks or remain for many months. The best way to prevent acne scars is not having acne, it sounds logical, doesn’t it? When the skin has no acne at all, the inflammatory process does not occur, so the skin remains intact. But, if you have acne and can’t eliminate it, the best recommendation is to Never pick the pimples! This only produces an increase in the inflammatory response and the probability to get the skin infected, which worsen the scar. 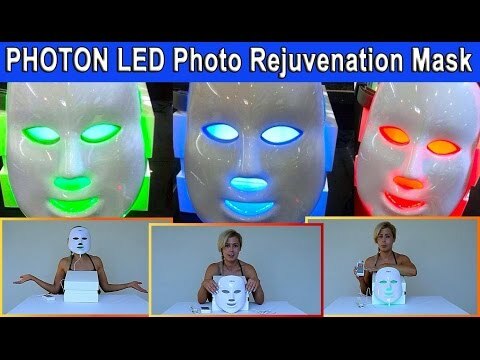 Another way to prevent future breakout is by using LED Light Therapy. LED therapy utilizes red, blue or green LED lights to remedy skin problems. It has zero down time and absolutely no side effects. Red LED (650 – 730 nm) has the ability to stop inflammation, improve healing, stimulate collagen production, and repair acne lesions. The healing effects of red light are well known. Many users reported skin plumping effect after several uses. Blue LED (430 – 450 nm) can penetrate deeply into the skin and destroy acne bacteria with no irritation. By eliminating acne bacteria from beneath your skin, this will significantly reduce future breakouts. It is documented to reduce 90% of bacteria in just 3 days. Green light (525 – 550 nm) can balance color pigment, reduce fine lines, speed up the healing process of the wound and lighten scars. What are the basic treatments to Eliminate Acne Scars? There are a lot of easy ways to treat scarring. Below are several effective products for superficial scars. Some of these treatments include Rosehip oil, Retin-A, hydrocortisone creams and glycolic acid products. The scabs are part of the skin recovery process. When a person removes it before it falls by itself, the healing process is prolonged. As a result, this will worsen your skin damage. By using these kind of creams over the injury the irritation and redness can be reduced, this decreases the possibility of developing a scar. Copper peptide serum is more potent than vitamin C. It can smooth and soften your scars by inducing collagen and elastin production. Vitamin C serum is extremely popular for its ability to stimulate collagen production as well as preventing free radical damage. When a person uses products with glycolic acid at least once per month, it helps to exofoliate the external layer of the skin, stimulate collagen and reduce hyperpigmentation. When this is frequently done, besides having a smoother complexion, the person can remove the scar. Glycolic Acid Product Warning ! Never apply Glycolic Acid Products immediately after a skin needling procedure to avoid irritation. You can boost the absorption of your hydrocortisone cream, Copper Peptide or Vitamin C serum by skin needling with 0.25 to 0.3mm dermal roller. This will drastically increase the concentration and effectiveness of active ingredients in your skin. You can use 0.25 mm everyday or every other day ONLY if your skin can tolerate daily treatment without excessive dryness, redness or peeling. You should apply your topical product or within 15 to 30 minutes after your skin needling treatment. NEVER apply topical products that contain irritating or toxic ingredients immediately after a skin needling treatment because they can absorb deeply into your skin and cause side effects. What are the advanced treatments to remove Acne Scars? Skin needling allows the skin to absorb larger quantities of topical serums or creams with 0.25 or 0.3mm roller. Treating your skin with a 0.5 to 1.0mm microneedle roller can break down old scar tissues. It stimulates dramatic formation of new collagen and elastin fibers without damaging your skin structure. Microneedling doesn’t cause a loss of melanocytes, thereby improving skin’s appearance without the risk of abnormal pigmentation. Users with fine lines, wrinkles, scars or stretch marks reported 60 to 80% improvement within 12 months due to a significant increase in collagen and elastin growth as well as thickeing of the epidermis. Side effects include mild redness and peeling. Your skin requires 2 to 7 days recovery time depending on the aggressiveness of your treatment. Below is a simple before and after pictures. What do You Need for Skin Needling? You will need 2 types of rollers for treating acne scars. You need 1 roller (0.25 to 0.3mm) to boost the absorption of your topical treatment product. You also need another roller (0.5 to 1.0mm) to break down old scarring and to stimulate new collagen and elastin growth. You do not need to treat your entire face. You can spot treat your scars. You can 0.25 to 0.3mm roller every other day to increase the absorption and efficacy of your favorite serums or creams. It can also thicken your epidermis. You can only use it daily if your skin can tolerate daily treatment. For moderate to deep scars, you can use 0.75 to 1.0mm roller ONCE per month. 1.5 to 2.0mm Warning ! You should never use 1.5 to 2.0mm roller without professional supervision. You can only use it ONCE every 4 to 8 weeks. You should roll back and forth 2 to 3 times in different directions (vertical, horizontal and diagonal) while pulling your skin tightly with the other hand. You should take it slow when treating hard-to-reach areas. This will prevent the slippage of your roller and cause unnecessary harm to your surrounding skin. How to Hold your Derma Roller? Many people held their rollers incorrectly and obtained inferior results. Your index finger should be on top of your roller handle. This will create maximum downward pressure for an efficent rolling session. This treatment removes the external layer of the skin via an abrasive device with sharp edges. Unlike the acid glycolic products, the dermabrasion should be done by an expert. However, mini-dermabrasion can be applied at home. This technique can offer mild results by offering a smoother and flatter skin surface to the person. The drawbacks of dermabrasion include painful irritation, oozing of the skin, inflammation, hypo/hyper pigmentation, sun sensitivity and 2 to 8 weeks recovery time. This treatment also removes the external layer of the skin, but in this case, chemicals are used in different concentrations, so it should be performed by a doctor according to your skin type. After the procedure, the skin repairs itself, and a new and smoother skin layer is produced. The most common peels used are Salicylic Acid Peel, glycolic acid peel, Jessner peel and Trichloroacetic acid peels (TCA peel). The drawbacks of chemical peels include irritation, oozing of the skin, inflammation, hypo/hyper pigmentation, sun sensitivity. The recovery time is between 2 to 8 weeks depending on the concentration of your chemical. TCA Cross Method MUST be performed by a doctor. It utilizes 50 to 100% Trichloroacetic acid (TCA) to break down old scarring and to stimulate collage growth. Your doctor applies the chemical via a thin wooden stick or toothpick. This procedure is extremely effective for treating “Ice Pick Scarring”. A drastic improvement is not uncommon after several treatments. The side effects of TCA Cross Method include inflammation, hypo/hyper pigmentation, sun sensitivity, scabbing and frosting of the skin as well as temporary worsening of the scar. The recovery time is between 4 to 12 weeks depending on the aggressiveness of the treatment. TCA Cross Method Warning ! Do not perform TCA Cross treatment at home. Improper procedure can result in scarring of your skin. If you have dark skin, you are also at risk of getting hyper or hypopigmentation, and it can last for several months! Consult your doctor before a treatment. This product has the capability of improving the skin coloration because it evens the skin tone and eliminates discoloration. Its use is also recommended for post inflammatory hyperpigmentation as well as sun damage. It is a natural skin lightening agent, but it should be used carefully. You should avoid sun exposure because it can cause new hyperpigmentation. Do not apply lemon juice immediately after skin needling because lemon juice can increase irritation. This product is very popular for treating acne and fine lines. It can also fade scars. But in this case, the person should seek professional advice before using it. It is also known to cause mild redness, irritation, peeling and sun sensitivity. Skin needling can lighten your scarring by boosting the effectiveness of your topical skin lightening products as well as normalizing the formation of skin pigment. You can do so by using a 0.25mm to 0.3mm roller every other day. Retin-A can increase irritation, peeling and even redness when used with skin needling. In order to avoid side effects, you should use the mildest concentration, decrease the number of application or avoid using it. Hydroquinone is a popular skin lightening ingredient, but it is toxic and known to cause skin cancer. NEVER perform skin needling with hydroquinone. In doing so, you will increase the toxicity in your skin. This can lead to side effects. Supplements can reduce inflammation, boost immune function, increase collagen production and speed up the healing process. Proper supplementation can reduce acne swelling and speed up recovery. Thus, this will minimize the severity of your scarring. Fish oil can reduce acne inflammation and balance your hormones by lowering your blood sugar. As a result, your skin recovers faster and have fewer breakouts. DMAE is extremely efficient in lowering inflammation. This diminishes the severity of your acne and scarring. Grape seed extract protects your skin collagen from free radical damage as well as reducing inflammation. It also stimulates the skin repair process. Zinc is also an anti-inflammatory agent. It boosts your immune system and clears up your acne bacteria. A healthy immune system can boost skin healing. Here is an AWESOME guide for anyone looking to improve their skin conditions greatly! Topics include: 1)2) How to correctly perform skin needling 3) Picking the best micro-needle roller 4) Derma roller reviews. Does Derma Rolling Acne Scars or Stretch Marks Really Work? I hope this article on skin needling at home with acne scars will help you tremendously. Is it better to roll in small patches or longer strokes? This is a personal choice. I personally roll in small patches because I can control the roller better without applying too much force. Can a 0.25 needle help fade hyperpigmentation? Yes if you are using topical skincare product that treat hyperpigmentation because 0.25 can boost absorption, thus boosting result. Please note that all topical product must not contain harmful, irritating or comedogenic (pore clogging) ingredients. Hello. Can you tell me what an appropriate schedule would be. 0:5 mm once a week and 0.25 every other day or is that too much? If I use 1 mm once a month the rest of the days nothing? I would greatly appreciate your feedback! Have been struggling with acne scars for a very long time. You really should use 0.5 and up ONCE every 4 to 6 weeks. YOu can use 0.25 in between treatment of 0.5 and up, but you should never start any new treatment if your skin is still irritated from the previous treatment. Weekly treatment of 0.5 is not a good idea. Some people recommend using 0.5 every 2 weeks, but if you never use a roller before, then you should stick with once every 4 to 6 weeks. Hi. I’ve been struggling with acne scars for more than 20 years. My question is if I use the 1.0 mm once a month do you still use de 0.25 every other day for product absorption? I would greatly appreciate your answer. Yes, you can still use 0.25 every other day for product absorption, but it is optional. BUT never use 0.25 until all redness are gone from your previous 1.0 treatment. IMPORTANT: All topical product MUST NOT contain harmful, irritating and comedogenic ingredients if use immediately after 0.25 treatment. I have boxcar scarring and I’ve done two sessions by myself with a 1mm dermaroller, the first one on August 1st and the second on August 30th. I was wondering if it is normal if I haven’t seen any improvement so far. Also, how can you tell if a boxcar scar is ‘deep’ or ‘shallow’. If deep, to what percent improvement can one get so that the deep scar is not as noticeable? This is a very tough question to answer. Everyone is different. I saw result with 2 treatments of 0.5, but my scars weren’t very deep (medium depth boxcar and rolling scars). I didn’t see much result with larger roller. The deep boxcar scar has deeper depth. It looks like chicken pox scar except it is not rounded. I have lots of acne scars i pop-up the pimples can i use 1mm roller and after that any cream or serum???? I used Jessners peel before. It is a strong peel. Jessners peel usually takes 2 weeks to recover. The first week your skin will dry up. The second week your skin will peel and become sensitive. You should wait at least 4 to 6 weeks before doing any rolling treatment.